Real crabmeat with diced onion, butter, & savory seasonings. Bring the taste of a beach-side restaurant to your kitchen. 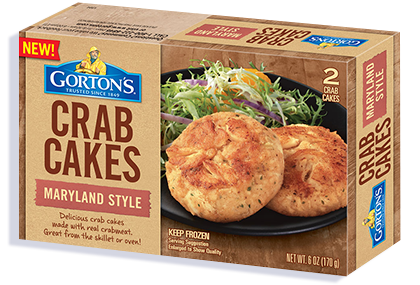 Made with real crabmeat and the perfect blend of seasonings, our Maryland Style Crab Cakes always cook up delicious in your oven or on your stovetop. UNCOOKED. KEEP FROZEN UNTIL READY TO USE. Remove crab cakes from pouch before cooking. *FULLY COOK CRAB CAKES TO AN INTERNAL TEMPERATURE OF 165ºF OR HIGHER BEFORE SERVING. 1. Thaw crab cakes in microwave on HIGH for 30 - 40 seconds. 2. Melt 1 Tbsp. of butter in a non-stick skillet halfway between low and medium heat. 3. Add thawed crab cakes to skillet. 4. Cook for 12 - 14 minutes, gently turning cakes frequently. NOTE: Stovetop temperatures vary, adjust times accordingly. INGREDIENTS: Crabmeat, Water, Mayonnaise [soybean oil, egg yolks, water, distilled vinegar, salt, cider vinegar, egg white solids, paprika extract (color), natural flavor], Breadcrumbs (wheat flour, evaporated cane juice, sunflower oil, sea salt, yeast), Diced Onion, Milk, Cream, Textured Wheat Protein (wheat gluten, wheat starch), Butter (cream, salt), Mustard (distilled vinegar, water, mustard seed, salt, white wine, citric acid, tartaric acid, spices), Less than 2% of: potato starch, celery seed, garlic, salt, parsley, spices. CONTAINS: CRAB, EGG, WHEAT, MILK. Not a significant source of vitamin A vitamin C, and iron. 110mg of EPA and DHA Omega-3 fatty acids per serving.